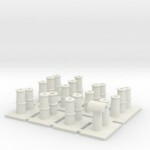 Scalescenes produce a range of downloadable card kits in a PDF format for you to print yourself. You can re-print as many times as you want to make up an extensive built environment on your layout, Kits can be combined and adapted to create your own customised structures. Click on the picture to the right to visit their website. To add even greater realism to Scalescenes kits, I have produced a range of customised 3D printed objects that can be used with them. The most simple enhancement is to substitute 3D printed chimney pots. The shape is more realistic than rolled paper and cheaper and less fiddly to install than metal castings. 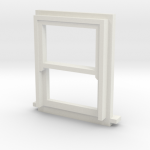 3D printed windows make fora more three dimensional representation of windows than cut window overlays and are a cost effect alternative to brass etchings. 3d printed doors also provide a degree of additional relief not achievable with printed card. 3D printed items are being added to this range all the time. If there is a particular kit that you want items for that is not yet in the range, please leave a comment in the comments section at the bottom of the page. A set of 10 sash windows matching the style and size of a Scalescenes large sash window. 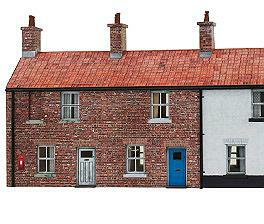 A set of chimney pots on mortar haunching to suit the Scalescenes T008 Low Relief House Backs downloadable card kit. Pots are printed on a connecting sprue to minimise printing costs. Separate from sprue with a sharp knife and file or sand smooth. The pots and mortar need then to be painted and can then be glued to the top of the card chimney stack. 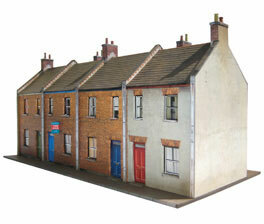 Windows, exterior doors and chimney pots to suit the T022 Scalescenes Small Terraced Houses Kit. Glaze window with acetate, and insert into openings from the inside into wall base layer with a small amount of glue applied to window architrave and internal sill to secure in place. 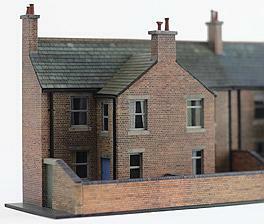 Chimney pots on mortar haunching to suit the T022 Scalescenes Small Terraced Houses Kit. 3 sets of pots are needed for the first pair of houses pots. Then two,a double row and single row for each pair of houses added to the terrace. Paint pots and haunching and glue to top of chimney stack. I need a few more copies of sheets for the Diesel Depot which I purchased last month, how does one get them on the computer to print out ? I think you need to contact Scalescenes about that, but when I use Scalescenes I just print out another copy from the PDF file supplied by them. Any news on scalescens n gauge church window? 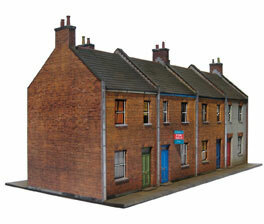 Any news yet on the N scale windows and chimney pots? I have done some. I need to see where I’ve stored the model files on my PC. Is there any particular model you want them for? It’s just a matter of finding the time. Any particular ones for me to put at the top of the list? Thanks for the offer to send additional windows, but Shapeways sent me an additional set free of charge (before you had made your alteration) Excellent customer service. 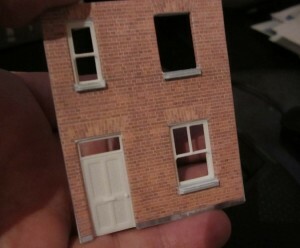 Will you be doing the full range of windows in n gauge for scale scene card kits. When I get time to re-scale them I will. I’m sorry I can’t give you a date yet for when that will be. I need to add these. There are a few at the Shapeways store already, but most need rescaling from OO and adding to the range.